Looking for a job at The Edward R. Murrow College of Communication? Visit WSU Jobs to view open positions in the college. Description of Position: The Edward R. Murrow College of Communication at Washington State University in Pullman, WA, seeks an Associate Dean for Academic Affairs. This will be a full-time permanent tenured 9-month position as a Professor or Associate Professor. Responsibilities include: Working with the Dean and Department Chairs to oversee the graduate and/or undergraduate programs; representing the Murrow College at key meetings and events when necessary; participating in budgetary and personnel actions; attending meetings with university leadership, college leadership and staff as appropriate; advancing the college’s commitment to diversity and multiculturalism in all activities; conducting and publishing scholarly research; teaching one undergraduate/graduate course per semester on topics of communication in one of the programs of the college; and performing other duties as assigned by the dean. Qualifications include: A Ph.D. in Communication or a related field; an active research program and a publication record that is commensurate with Murrow College and WSU standards for appointment to the rank of Associate or Full Professor; evidence of successful teaching at the undergraduate and graduate levels; and successful administrative record in an academic unit containing relevant undergraduate and graduate programs. Salary: Will be competitive and commensurate with experience. Application Procedure: To be considered for this position, applicants must submit a letter of application summarizing qualifications, a curriculum resume or vita, recent teaching evaluations, and contact information for five references, and apply online at www.wsujobs.com. For questions, email inquiries to Dr. Alex Tan, alextan@wsu.edu, or Dr. Stacey Hust, sjhust@wsu.edu, who are chairing the searching committee. Review of complete applications will begin November 19, 2018, and will continue until the position is filled. WASHINGTON STATE UNIVERSITY IS AN EQUAL OPPORTUNITY/AFFIRMATIVE ACTION EDUCATOR AND EMPLOYER. Members of ethnic minorities, women, special disabled veterans, veterans of the Vietnam-era, recently separated veterans, and other protected veterans, persons of disability and/or persons age 40 and over are encouraged to apply. WSU is committed to excellence through diversity and faculty-friendly policy action, including partner accommodation and NSF ADVANCE Institutional Transformation programs (http://www.advance.wsu.edu/). WSU employs only U.S. citizens and lawfully authorized non-U.S. citizens. All new employees must show employment eligibility verification as required by the U.S. Citizenship and Immigration Services. WSU is committed to providing access and reasonable accommodation in its services, programs, activities, education and employment for individuals with disabilities. To request disability accommodation in the application process, contact Human Resource Services: 509-335-4521(v), Washington State TDD Relay Service: Voice Callers: 1-800-833-6384; TDD Callers: 1-800-833-6388, 509-335-1259(f), or hrs@wsu.edu. The Edward R. Murrow College of Communication at Washington State University in Pullman, WA invites a full-time, 9-month academic year, Clinical Assistant Professor in Strategic Communication. Appointment begins either January 5, 2019 or August 16, 2019. Qualifications: Professional (clinical) candidates will have earned a master’s degree before the date of hire with at least three years of professional experience in related area. Successful candidates will be expected to advise undergraduate students and serve as a liaison with the professional community and other outside constituents. Ability to contribute to a professional online MA program in Strategic Communication. Preferences: Ability to teach undergraduate classes in one or more of the following areas: digital advertising, digital public relations, digital content promotion, web design and usability, media planning, or strategic campaign planning and management. Professional experience across multiple media platforms, knowledge of software applications relevant to the position, evidence of successful teaching experience. More than 5 years of experience is preferred. Applicants should submit a cover letter summarizing qualifications, curriculum vitae, and contact information for three references and apply online at www.wsujobs.com. For more information, contact Stacey Hust, Chair of Strategic Communication, sjhust@wsu.edu. Review of applications will begin September 15, 2018 and the position will remain open until filled and is subject to available funding. Description of Position: The Edward R. Murrow College of Communication at Washington State University in Pullman, Wash., invites applications for a permanent full-time tenure-track position, either at the Assistant or Associate level to begin August 16, 2019. Requirements for Assistant Professors: Earned Ph.D. in communication or related field before the date of hire or nearing completion of dissertation in communication or related field but with all Ph.D. degree requirements completed before start of employment, evidence of potential for a productive research agenda in one of the preferred areas and evidence of potential for successful teaching. Requirements for Associate Professor: Earned Ph.D. in communication or a related area before the date of hire, have served at least 6 years as an assistant professor or equivalent, and a record that indicates a nationally recognized research program in communication that meets Murrow College standards for tenure and evidence of successful teaching. Preferences: We seek candidates who can combine their primary interests in health or science communication with an emphasis in one or more of the following research and teaching areas: underserved populations; social issues; intercultural communication; gender and communication; media, youth and adolescents; digital and media literacy; communication technology; communication, emotion and cognition (psychophysiological research); strategic communication. The Murrow College prefers candidates with a strong background in quantitative methods who can demonstrate success or potential for securing extramural funds. Duties: Contribute to one or more of the College’s research areas through graduate and undergraduate teaching, scholarship, and grants in health or science communication. 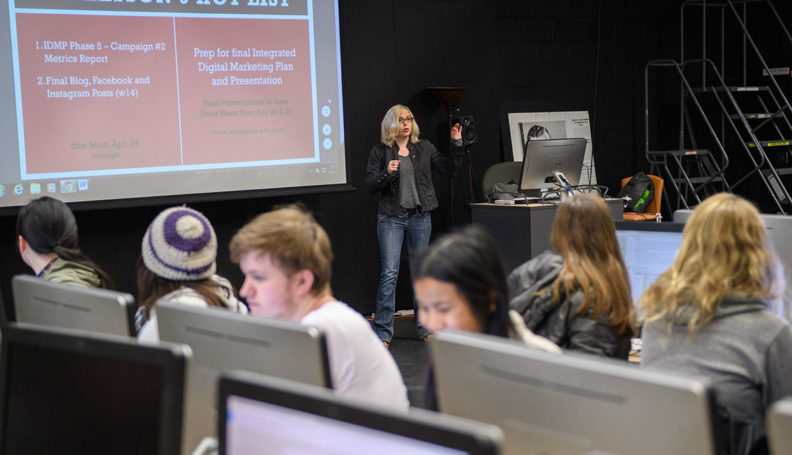 Teach courses in one or more of our three Departments of Communication and Society, Journalism and Media Production, or Strategic Communication. In addition, candidates are expected to collaborate with interdisciplinary research groups and centers. Application Procedure: Applicants must send a cover letter summarizing qualifications, curriculum vitae, a brief research statement, and contact information for three references and apply online at www.wsujobs.com. In their materials, candidates should address which of the research areas mentioned above best fit their interests and how they can contribute to the teaching needs identified above. Review of applications will begin November 1, 2018. The position will remain open until filled and is subject to available funding. For more information contact Stacey Hust, Chair of Strategic Communication Department, sjhust@wsu.edu. Washington State University is an equal opportunity/affirmative action employer and educator. Members of ethnic minorities, women, Vietnam-era or disabled veterans, persons of disability, and/or persons the age of 40 and over are encouraged to apply. WSU is committed to excellence through diversity and has faculty friendly policies. Learn more about our academic departments.